Maegan receives an award for Spirit of the Garden from Hilton. This award is only given to a select few employees nationwide. 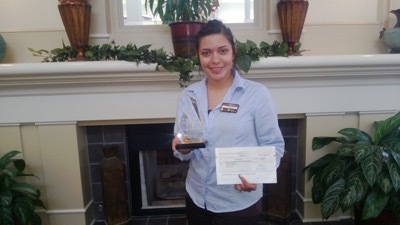 In addition to the award she also received a cash award and recognition via phone by the corporate office of Hilton. 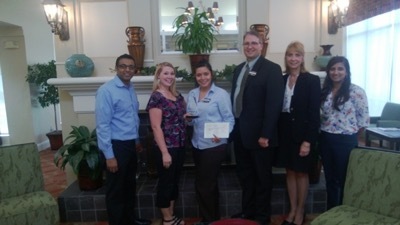 Pictured above from left to right, Pete Patel, CEO of Promise Hotels, Heather Crenshaw, AGM for Hilton Garden Inn Tulsa International Airport, Maegan Quesada, Front Desk Supervisor, Grayson Davis, GM for Hilton Garden Inn Tulsa International Airport, Cindy Seidler, Director of Human Resources for Promise Hotels, Tina Patel, CFO of Promise Hotels.